I had quite a time finding the name of this Evening Primrose. The wildflower book I use for my area has a very poor example and I think the foliage is misrepresented or I would have identified it sooner. I just couldn’t believe it wasn’t in that book. 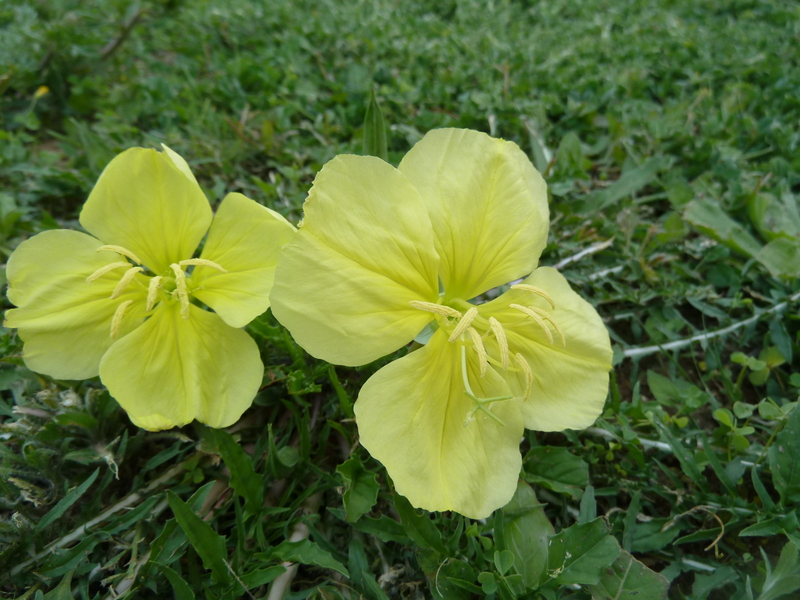 The Stemless Evening Primrose will bloom in the evening and bloom all night long. My back yard it full of them and it is fun to look out the bathroom window in the morning and see all their blooms scattered throughout the yard. This variety one stays fairly low to the ground and has dandelion-like leaves. The flowers each form on their own stem. I am not sure why it is called stemless. I can only guess that it is because most of the other types of primrose have a taller stem that will hold many flowers and grow much taller. This one does not. I can mow over these plants and within a few days they have flowers again. The leaves stay pretty flat to the ground at that point. If they are in an area where I do not mow, the can develop a bit more full and stand about 8-9″ in height. 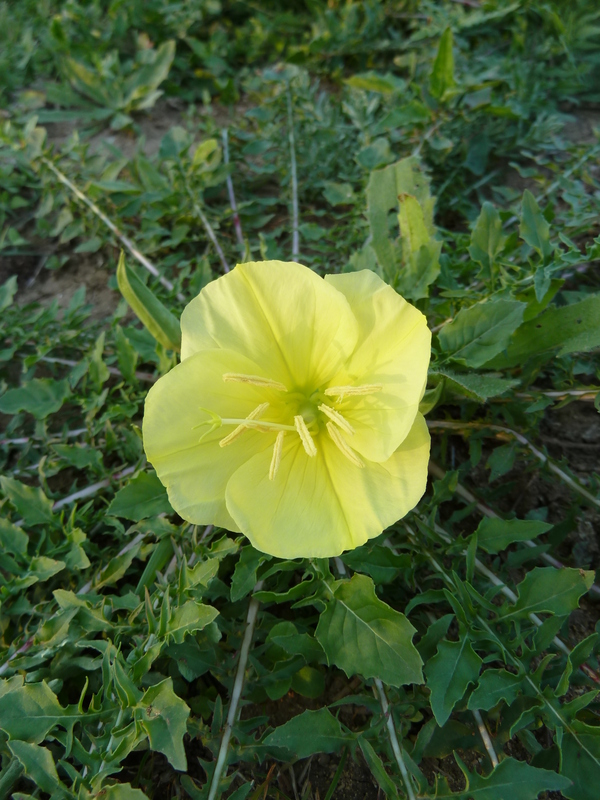 This entry was posted in Flowers, Garden, Texas Natives (plants) and tagged Blooming right now, Evening primrose, oenothera triloba, Stemless Evening Primrose. Bookmark the permalink. I have heard of primrose but never seen them, they sure are pretty! They really are beautiful. In the evening when they start to open the yard is littered with the beautiful yellow flowers. And in the morning when I look out the windows, the flower are still there and will start to fade soon. I have been looking for this plant! My mom had them for many years. Where did you get yours? Thank yo uso much for sharing! It just comes up each spring throughout my yard. As far as I know, it is a wild flower. If there is a wildflower center in your area, maybe they have seeds. It would be worth a call if you have one in your area. I have never seen it sold (at a nursery in a pot), but maybe at a native plant sale if you have those in your area. What area do you live in? Indiana. I have read that they are extinct in my area. Yes, I have looked on wildflower sites. I am not aware of any Wildflower nursery’s in Indiana. I did order what was “supposed to be” the oenthera triloba but received a 3 foot bush labeled Primrose? I just happened upon your Photo which was new in my search. interesting. I am going to go out and see what I see for seed pods and let you know. Tracey – I figured out the seeds on the evening primrose. Once the plant dies back all the seeds are kept in the base and there are TONS of them. I knew this, I can’t figure out why it took me so long to remember….. glad I did. I can collect seeds for you when they dry out. I live in Ft. Wayne, IN and received a plant from a co-worker 15 yrs. ago. Since then I’ve had hundreds grow, and given away as many. Give them a try…you who’ve sorry. Chris would love some if you have them to spare….. They sure have travelled haven’t they. Hi Joan. Thanks for stopping by. It is interesting hearing about your sisters plants. The seed pods have started forming here already and occasionally I come across one from last year. They have done well this spring with the winter rains that we had and some are even still blooming with the cooler temps we have had lately and rains. I have never deadheaded them and they still seem to create a huge seed pod full of seeds. I work at the St. Jacobs Market, Ontario, Canada. We sell these, though we’ve always called them Moonflowers. I haven’t been able to find them around here, Niagara falls. Ive just relied on them re-seeding every year. Good to know there are some available to buy. I have them growing here also in Niagara falls. I love them because they are unique. They were here when we moved. Someone said they are considered to be toxic, is there any truth to that? My mom has always called them Moonflowers . Hi Nataie – That is great that you have them growing and re-seeding themselves. I have not heard them called moonflower, that might be a common name for them in your area. Not sure. I have heard of datura being called Moonflower and that is a toxic plant. I do not know about the primrose in this post. Hi Yes my mom and grandmother said they were toxic, I wonder if that is true. Hi Nat – I am not sure. My late boyfriend who lived in the Detroit area planted this type of moonflower in my yard years ago. I live in Pennsylvania. I loved that plant. Sadly, last year it never came back. If ANYONE knows where I can get seeds I would be eternally grateful. It was memorial to my boyfriend who passed away unexpectedly in 2010. I am too, Linda looking for them. The only place that I have the found the plants is in Erie, Pa. at Mason’s greenhouse…I would like to find the seeds as well. Hi Linda, thanks for stopping by. I did not have any stemless primrose blooming in our yard this year so I do not have any seeds to share and I have no idea where to buy them. I am looking for seeds or just the plants. My local greenhouse has tried to sell me something else. I too was sold something else! the Description was of a night bloomer. When they arrived in the mail it was a bush! Returned unhappy camper! 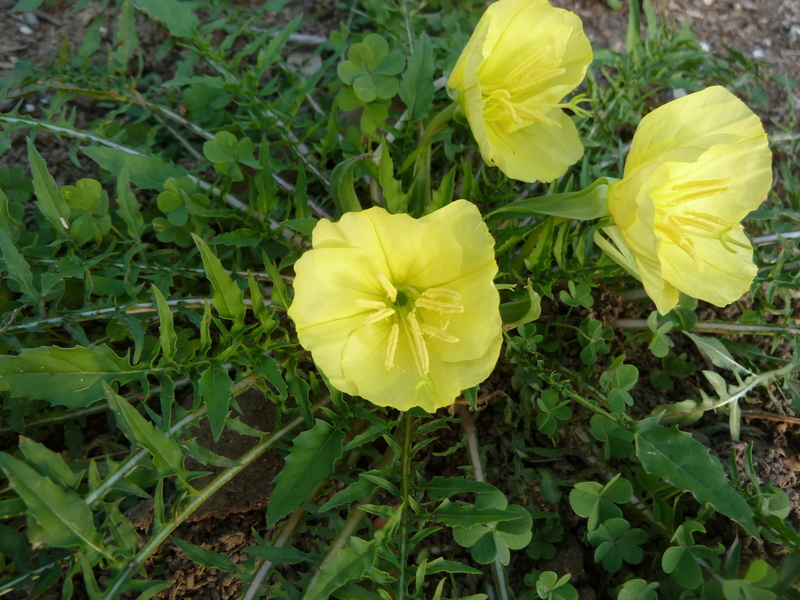 That is the evening primrose that we have. It grows better in my sisters driveway. Stemless might mean that the seeds produce under the foliage. Be sure to dead head them in the morning to get more flowers and more seeds. We have had a lot of arguments on them, even from a person that says she knows all about flowers. My sister spent 2 days gathering them for a plant sale and this person changed all the signs so my sister does not do it anymore. She even took off all the pictures I put on them, since of course nobody will buy a dandelion plant. I think that is why they do not reproduce too good. Hi Joan – yes – the seeds on my variety are at the base of the stem and I can collect them after the plant has died back and dried in the late spring early summer. It’s like a bit pod partly in the ground that houses a lot of seeds. My flower heads are also quite large – I’d say bigger than a silver dollar. I didn’t have but a few blooms this spring, but my neighbor had a lot more in his yard than years past so I still got to enjoy them in the early morning when I was outside. They are such a pretty bloom. On your dandelion comment. I’m laughing because while I won’t buy a dandelion plant, I did get seed last year to get dandelions growing in my yard/garden (yes, I did it on purpose) for harvesting the leaves to eat, the root for medicinal tincture and the flowers for infusing in oil for lotions or flowers for future wine making. How do you collect the seeds from the plant…and when and how do you replant them? Also, what does it mean in plant speak when a plant or something like a morning glory vine for example “re-seeds” itself?? Thank you! Hi Gia – in the Stemless Primrose that I have growing the seeds form in the base of the plant after it has completely dies back for the spring/summer. It leaves a “pod” of sorts in the ground and all the seeds are in that. You can read more about it in the comment and replies above. I collected the seeds from the pod in the ground and just scattered them in the fall. Depending on where you are from, there might be a different variety of primrose growing so the seeds may be on a different part of the plant. When a plant re-seeds itself that means when the flowers die back and the seed pods form and dry out, they open and naturally scatter the seeds – so it self-sows of self-plants its own seeds and they will germinate when the conditions are right.